A labyrinth of about a thousand passageways, the Bhool Bhulaiya at Bada Imambara in Lucknow, has intrigued traveler as well as architects for the last two hundred years. The fourth Nawab, Asaf-Ud-Dowhala, commissioned the building during the drought year of 1784 AD to help the poor make a living. 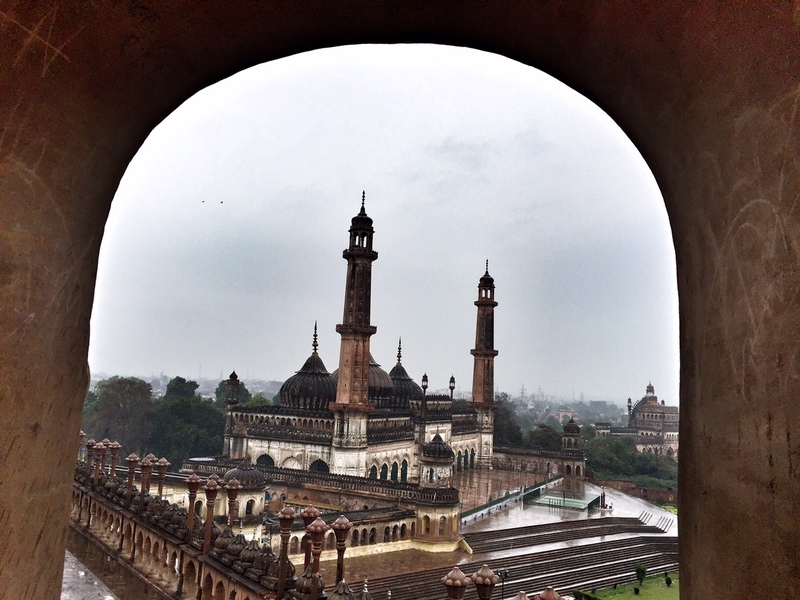 However, from the time it was finished, it became a symbol of pride and grandeur of Lucknow. To understand anything about Bhool Bhulaiya better, it's important to know about its builders - Nawabs. Quite surprisingly, it was only during my most recent visit to Lucknow that I understood who Nawabs actually were. I always assumed that they were kings who existed at the same time as Mughals, and somehow managed to live peacefully with them so close by at Delhi. The term Nawab comes from the Perisan word Naib which basically means Deputy. Nawab was a title conferred by the Mughals to their deputies across North India. It was a title for males only and the female equivalent was begum (the most famous of them being Begum Nazrat Mahal). With the mutiny of 1857, the Nawabs and their domains went into decline, though the title didn’t disappear. It became a family title and even now you can find true blue Nawabs in Lucknow, though with little power or money. It is neither a mosque nor a dargah. 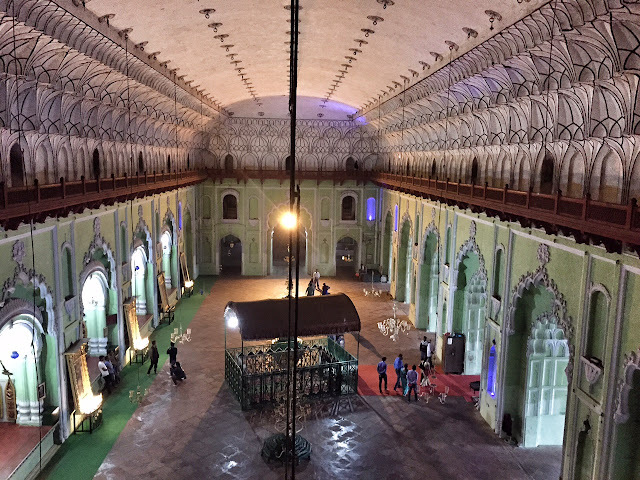 An Imambara is simply a hall where Shia Muslims come together for various ceremonies, especially related to the Remembrance of Muharram. Muharram is basically a period of mourning for all Muslims, especially for Shias, and marks the anniversary of Battle of Karbala where Hussein-ibn-Ali, the grandson of Muhammad, was killed in a battle. Imambaras are present in many other parts of Asia - in Bahrain and UAE they are called ma’tam and in Central Asia they are known as takyakhana. Some of the biggest and most significant Imambaras in the world are now located in India and Pakistan, which also have sizeable Shia populations. The history of the Bhool Bhulaiya is closely linked to the Bada Imambada. 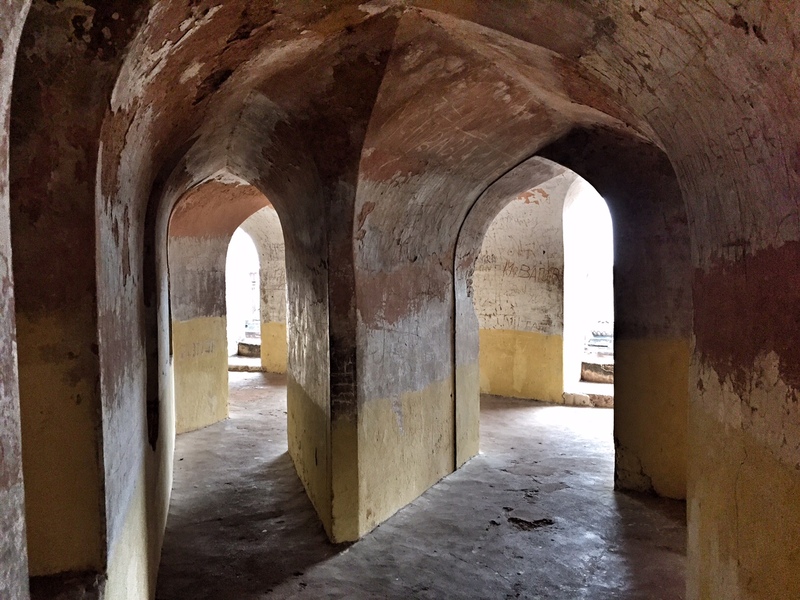 In the late 18th century Avadh was reeling under severe drought and to provide employment to his people, Nawab Asaf-Ud-Dowhala decided to build the Bada Imambada. You can think of it as very similar to MGNREGA (Mahatma Gandhi National Rural Employment Guarantee Act). There are many other buildings in the country which were built with this purpose, including Aga Khan Palace in Pune. The guide will tell you that it was designed by architects called especially from Persia (modern day Iran) which was a prominent Shia kingdom back then, but the truth is a little different. Once the Nawab decided to build the mammoth building, he invited bids and it was won by Hafiz Kifayat ullah, an architect from Shahjahanabad (present day old Delhi) who was already a famous man then. Work on the building started in the 1784 and finished fourteen years later. So why was Bhool Bhulaiya built? 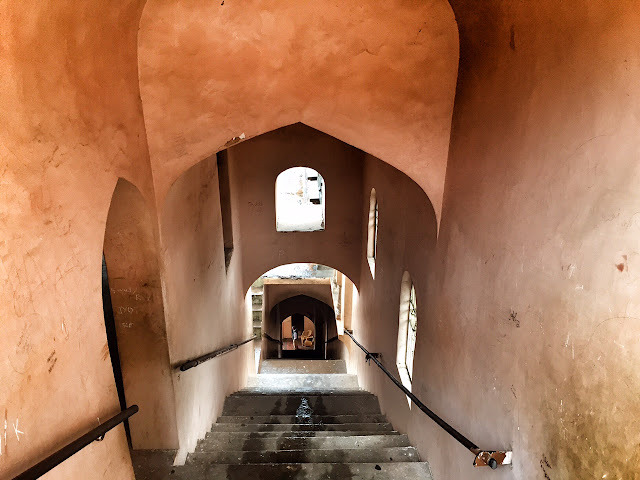 Even as the architects spent days, weeks and months designing the Bada Imambada and the other buildings in the complex (including the mosque and the step-wells), the architects were given an interesting challenge to work on. For prayer purposes, it was decided to build the Central Hall (170ft x 55ft) without any columns! Its a very large structure and building it by conventional means would have required columns to bear the load of the ceiling, including the mammoth dome. The ingenious architect decided to work on reducing the weight of the ceiling by making it hollow - and that exactly how the Bhool Bhulaiya was born! Unlike the buildings to today, much pain was taken to design even this part of the building as beautifully as any other part of the Imambada. The result is a labyrinth of interconnected passageways and doors. There are about a thousand such passageways and most of them lead you nowhere but another passage. If you get into the labyrinth, it is quite easy to get lost and might take a while before you manage to come out. Many of these passageways open into windows which give you great views outside and some also take you up on the ceiling. As a kid I was literally sacred of going here by myself, and there were so many stories of people getting lost (and never be found again) that even when I went as an adult for the first time there, I was initially apprehensive to go in by myself. Anyway, I did go though not very deep and managed to come out. 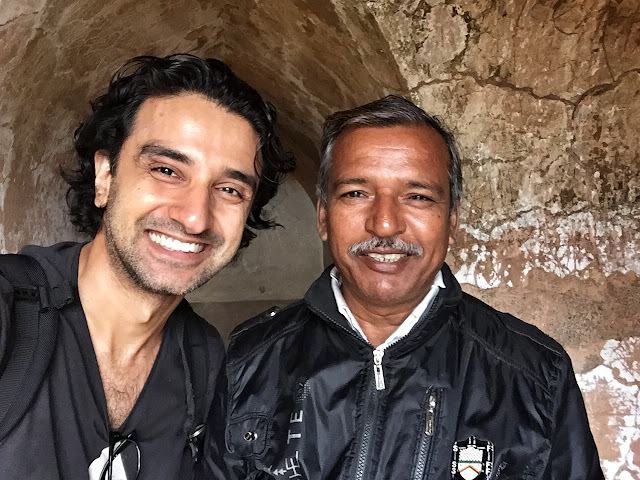 I had already hired a guide and want to know all the stories about the place so next visit was with him. Well, he was just as how any guide would be - full of stories, some real, and many fictitious. I also interviewed him and you can read about him here. Timing: The Imambada opens at 6am, though the Bhool Bhulaiya opens only at 9am. Reach a little before 9 and explore the entire complex as there are many more places to see and photograph. Interestingly each has its own unique story. Guide: I guess its fun to hire a guide, though I would not advice on trusting all that they say. They are not expensive and depend on tourist to make a living, and I guess that’s what pushes them to talk more about the legends than actual history. Photography: It’s one the best places to photograph in the city, especially if you love architecture photography. I took all the pics using just my iPhone but I think they would be way better if you could use a DSLR. What to carry? A small backpack with camera, chocolates and water would be sufficient for the trip. You can be done within 2-3 hours though I recommend spending much more time there. Lucknow is well connected from all the metros and other major Indian cities by air, road and rail. Most flights will fly you via Delhi, with a small stop-over. Train network is even better and virtually all trains from Delhi to East of India stop by in Lucknow. Additionally, Lucknow is also well connected by buses. However, the roads aren't great in UP so I would recommend it only for short distance travels. If you are a budget traveler, then this third option might work better. This is where I stayed on my last Lucknow visit. Wonderful post, marvellous pictures and a great story. I have been to Lucknow many times but never got chance to visit Bhool Bhulaiya, will surely visit it next time. Nice post and superb pics. Interesting post on Nawabs, Imambara and Bhul Bhulaiya, am yet to visit Lucknow. Do check out EPIC channel it you haven't yet. A superb TV channel on Indian history, heritage, culture, food and more, am sure you would like it.. I am sure you will enjoy Lucknow :) And thanks for suggesting the channel...since I rarely watch TV, it wouldn't have happened while surfing! Fabulous - what adds to the beauty is actually the rain - gives a depth of colour often missing in the heat! I agree Yamini, its more of a maze than a labyrinth! Lovely place and wonderful photos. Thanks for sharing. A very interesting place. Nice post, Sid. The architecture is incredible. I am loving this type of design. Splendid photography as always. Personally I can easily manage to get lost without any building designed for the purpose! The pictures and the story, both are intriguing. The rains, the colors and the stunning architecture come together so beautifully. 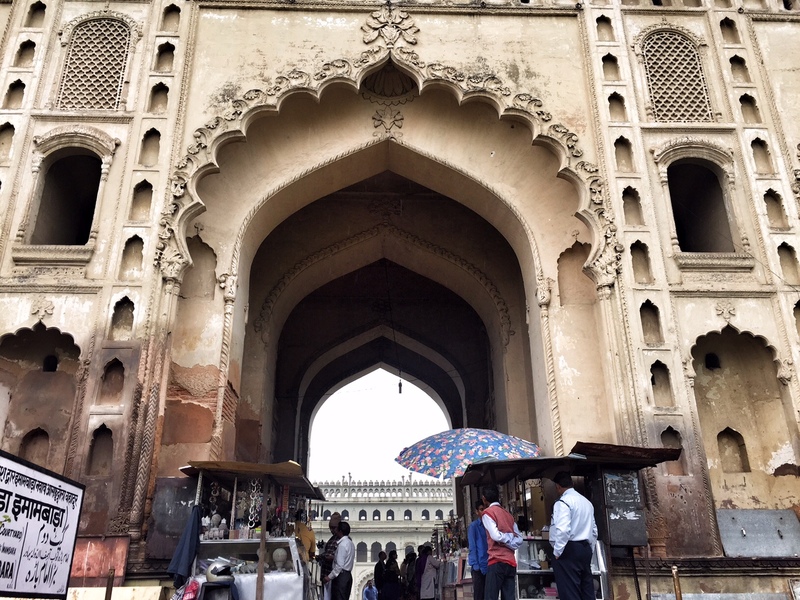 I recently visited the Chowmahalla Palace in Hyderabad and was so fascinated by the Nawabs and their lives that I am eager to read about them! Thanks for sharing these breathtaking images! Beautiful shots of the place. A must visit place. You make Lucknow so inviting. It goes on the list of places to visit in India. Thanks. However, one can only admire such great architecture! So true Mariette...you made a very interesting observation indeed. All civilizations from past have managed to do it.. Your post reminded me of my childhood days when Bhool Bhulaiya used to be one of the favorite places to visit on my trips to Lucknow during the summer vacations. Nice Article Siddharth. Bhool Bhulaiya is one of the popular monument in lucknow. The architecture is incredible. I lived in Lucknow as a kid, for five years in 1944. I still remember my days there. I have vivid memories of bada imambara with bhool bhulayaan, chota imambada, chatar manzil and the zoo at Banarsi bagh. After 68 years, I'm again getting a chance to revive my memories of Lucknow as my niece's wedding is in Lucknow. I am excitedly waiting for this trip. 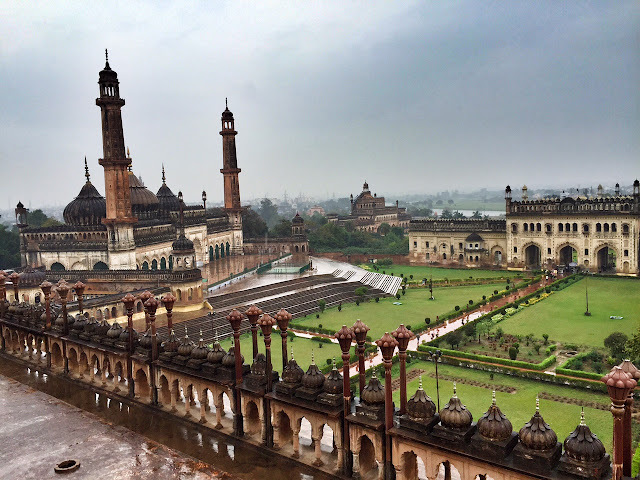 Nice article about Bada Imambara , thank you for sharing this information. India has always had a natural talent for building amazing monuments, and the colours... Love it! I googled and found your post. It satisfied my curiosity to a certain extent and thanks a lot for this wonderful post. I have not seen any modern architect or student doing PhD on this magnificent and mysterious building. Splendid photos! I will be travelling to Pune next month and was looking for places to see and visit. I always skip the travel sites and instead check out the photos of that place to get a better idea. So I think my work here is done before the travel. Thanks a lot. 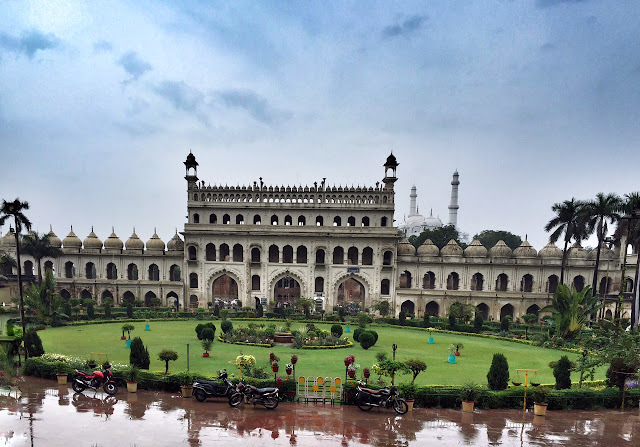 Supar and Amazing article about Bada Imambara , such a historical place. I read a good article and such a useful information. BHOOL BHULAIYA is an awesome and Amazing place. I like your suggestion, because I always ready for the travelling in India. I also like this blog story for Bhool Bhulaiya is a fantastic place for the travellers. I also want to go there. Can you please provide the contact number of the guide? I am.on the way to Lucknow now! Hi Sovon, unfortunately I don't have his number. You will be able to meet all the guides at Bhul Bhulaiya itself...that shouldn't be a problem. I like this blog, thank you very much about it. This is very exciting travel to Lucknow. NICE ONE SIR..KEEP UP THE GOOD WORK..BEAUTIFUL PHOTOGRAPHY..